In this lab you will investigate using a GA for creating a fault tolerant system. You will evolve a set of 4-bit parity generators and place them in a TMR architecture. Faults will be injected into the parity generator circuits and if a failure is detected, evolution will be used to re-evolve the circuits back to full functionality. Parity data indicates the numbers of logic '1' bits in a block of data. Parity bits are normally added to the end of a data word to provide a method of detecting alterations in the word's data. The two types of parity bit are even parity and odd parity. When using even parity, the parity bit is set such that the total number of 1s is even. Odd parity is the reverse, the parity bit is set to create an odd number of 1s. The truth table below demonstrates this. You will be creating a fault tolerant circuit implementing the above 4-bit parity generator truth table. The cell and cell array designs used in this lab have been modified from those used in Lab 1. The cell circuit is shown below. The main differences from the previous design are the reduction in size of the LUT and the inclusion of a failure injection multiplexer. 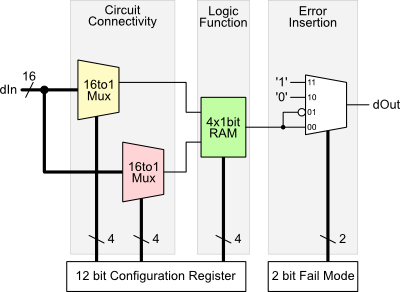 The choice of failure mode is set by the 2-bit Fail Mode register. The different failure modes are described in the table below. 0 (00) No fault, the cell output is unaltered. 1 (01) The LUT output is inverted before leaving the cell. 2 (10) Stuck-at-0, the cell output is held at '0'. 3 (11) Stuck-at-1, the cell output is held at '1'. The cell now has 12 configuration bits due to the removal of one input connection multiplexer and the reduction in LUT size. Their order and function is shown in the figure below. The new Cell Array uses 32 cells in a 4 by 8 grid. The interconnections between the cells are different from the previous lab. As before, each cell has a 16-bit input, but this time the bus is created from different sources. Each cell has a connection to the 4-bit input (red) and an inverted copy of this input (blue). The remaining 8 bits are made out of the outputs from the cells of the previous column (orange). For the special case of the first column, these 8 bits are held at '0' (green). The cell array outputs can be taken from any cell in the array. 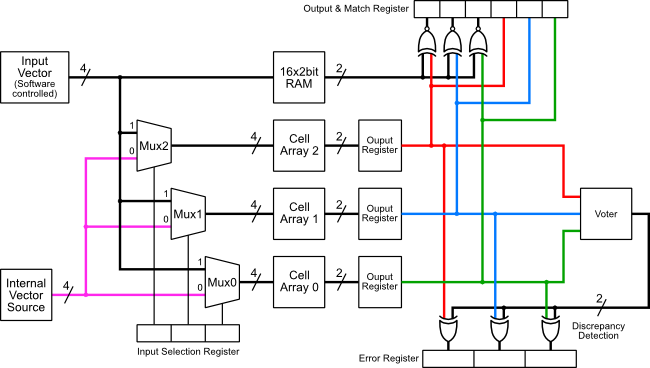 The output selection multiplexers are connected to all 32 cell outputs (purple). The two array outputs, dOut1 and dOut0 are derived from these 32 signals. 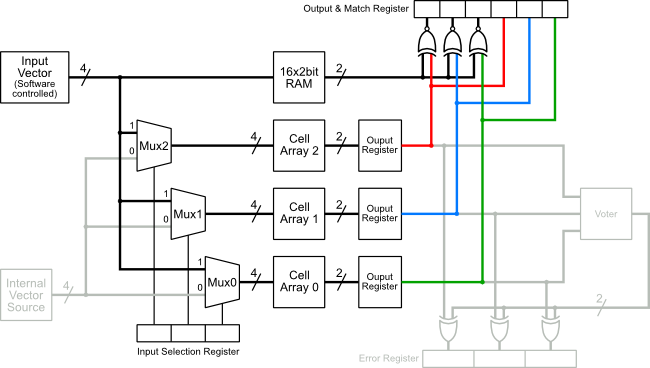 The configuration bits for the output selection multiplexers are shown in the figure below. 5 selection bits are required per output (25=32). The cell array structure has been altered to improve the circuit's ability re-evolve solutions after a fault has been injected. Think why this is the case. Three cell arrays are enclosed in a block called FTBlock. The structure of this block is very similar to the EvoBlock used in the previous lab, except this time there are three rather than eight cell arrays. The structure of the FTBlock is shown in the figure below (at the moment you can ignore the circuitry in grey). As before, there is a RAM block to hold the target truth table, and a set of xnor gates for calculating the match between the RAM outputs and the cell array outputs. The mask register function has been removed as we shall always be making use of all (both) cell array outputs. The format of the FTBlock Output & Match register is shown below. Triple Modular Redundancy (TMR) is static redundancy architecture. It provides a method for masking faults in a system. The left-hand figure below shows the TMR architecture. Three functionally identical units are used in parallel. A voter unit is used to generate a single output that is a majority vote of the three system outputs. Therefore, if a single unit fails, the two others will out vote it, and the voter output remains correct. The right-hand figure shows the circuit for a voter. The figure below shows the full FTBlock circuit. You should be able to see the TMR architecture within this circuit. 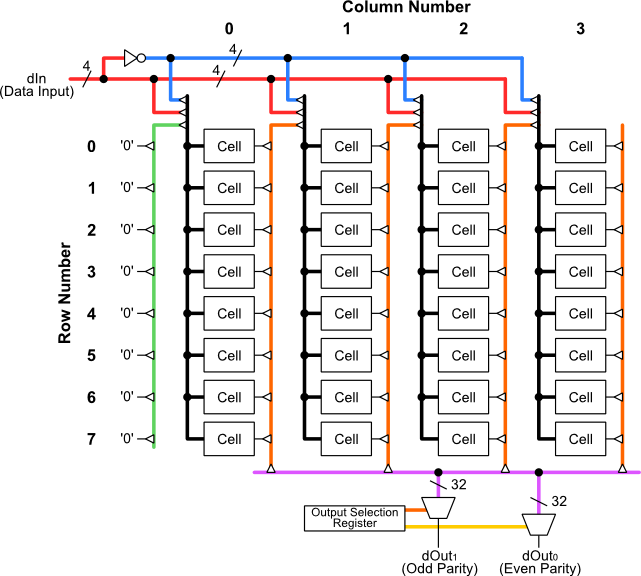 The outputs from the three cell arrays are connected to a voter. A set of three xor gates, labelled Discrepancy Detection, are used to indicate the failure of a cell array to output the correct parity data with respect to the voted output. The full hardware system and a software shell have been setup for you. The project files can be downloaded using the link below (refer to the previous lab if you've forgotten how to open up the project). Remember, you will probably have to use local temporary storage space to unpack the project to avoid disk quota issues. The file that needs completing is exp1.c, this can be found in the project's code directory. The areas requiring attention are commented with a TODO flag. The following sections will guide you through filling these sections. The Function Reference provides extra information. As before, you need to load in a truth table for the target circuit into the RAM block. The format for the RAM word is shown below. Bit 1 holds the odd parity bit and Bit 0 the even parity bit. - This macro applies an input vector to the FT Block and sets the look up address for the Target RAM. - This macro loads the location in Target RAM pointed to by the applied vector. Note, that calling this macro automatically increments the vector value. When you have filled the function, compile and download the design. The target RAM will be loaded using your function, then the contents will be retrieved and output over the serial port. Check this output to see if your loadTargetTruthTable function has worked correctly. When the target RAM is being loaded correctly, comment out the return statement labelled STOP1 and continue. Completing the GA requires a number of tasks. The first is to create the fitness function. The function prototype is shown below. This function needs to calculate an individual's fitness from the match data passed to it. As before, a '1' represents a match and a '0' a difference in output. The match data passed to this function is for a single cell array. The value is 2 bits, shifted towards the LSB. You also need to calculate what the maximum fitness is for the parity generator. Set the define MAX_FITNESS to this value. You need to write a mutation function for this system. The prototype of the mutate function is shown below. Again, search for the TODO to see where you should add your code. As before, the configuration for a complete cell array is held in the ArrayConfig structure. This structure is declared in the ftBlock.h file. Spot the addition of the members for the output selection configuration. You will need to take these into account when writing your mutation function. For this lab, the job of evolving a solution is enclosed within a single function, findSolution. This allows us to call for a new working configuration on demand. The function prototype is shown below. The arrayNum argument is the number of the cell array that should be used for evolution. Only a single array is used so the functionality of the others is not disrupted. The function returns a success value, 0 if a working solution was found, 1 if no solution was found. A basic GA has already been written within the findSolution function. Once you have written your calcFitness function, calculated the MAX_FITNESS and written your mutateArrayConfig function, compile your code and configure the FPGA. The code will try to find three working parity generator solutions, one for each cell array. If this succeeds, comment out the return statement labelled STOP2. Three of the development board's switches can be used to inject faults into the cell arrays. Press one of the buttons indicated in the figure below. The fault location and type will be output over the serial port. If the fault has caused a cell array failure, the corresponding LED will light and the system will attempt to re-evolve a solution. Note: It is possible to inject a fault and not cause a failure. This occurs if the fault is injected into a cell that is not being used by the current evolved solution. However, when re-evolution is triggered, all the faults injected so far will still be present. Once you have the basic system running, there are two areas to investigate further. The first is to improve the speed of the GA's convergence to a solution, thus making recovery as quick as possible. Secondly, try adapting the GA to produce circuits with intrinsic fault tolerance. That is circuits that can accommodate faults without failure. Two approaches can be taken. Try forcing evolution to find solutions that use the minimum number of cells. This will increase the number of failed cells a cell array can take before failure. Or try testing a circuit's resistance to faults during evolution. Below is a description of the ftBlock.h and ftBlock.c files. These are used to help with interfacing with the FTBlock module and to perform various evolutionary tasks. NUM_CELLS defines the number of cells in the array, in this case 4 columns * 8 rows = 32. NUM_CONFIG_BITS is the number of bits used to configure a cell, in this case 12 bits. NUM_OUTPUT_SEL_BITS is the total number of bits used to select the cell array outputs. The ArrayConfig structure holds the configuration for a complete array. It also has a member to hold the configuration's fitness. A 32 bit unsigned int is used to hold a cell's config data, however, you'll only be using the first 12 bits of this data. There is also the outputSel members for holding the output selections, only 5 bits of each is used. This sets the array which will receive configuration data when using the FTBLOCK_writeConfig macro and the output selection data when using the FTBLOCK_writeOutputSel macro. This selects where a cell configuration is written to when using the FTBLOCK_writeConfig macro. Note that the cell number is automatically incremented when FTBLOCK_writeConfig is called. This writes configuration data to the cell selected with the FTBLOCK_writeConfigArrayNum and FTBLOCK_writeConfigCellNum macros. Note that calling this macro automatically increments the cell number. This writes the output selection to the array selected with FTBLOCK_writeConfigArrayNum macro. Both selections are written at once. The data format is shown below. This selects the array which will receive the fail mode settings using the FTBLOCK_writeFailMode macro. This selects the cell which will receive the fail mode settings using the FTBLOCK_writeFailMode macro. This writes a failure mode to the cell selected with the FTBLOCK_writeFailModeArrayNum and FTBLOCK_writeFailModeCellNum. The fail modes are shown below. This sets which vector source will drive the cell arrays. The source may be an internal counter or a vector written under software control. There is a selection bit per cell array. Bits 2 to 0 select arrays 2 to 0 respectively. A value of 1 selects the external (software controlled) source, and value of 0 selects the internal vector source. Write a vector to the cell arrays. Whether the vector is actually applied to the cell arrays depends on the input selection settings set using the FTBLOCK_writeInputSel macro. This writes a value to the target RAM at the address pointed to by the vector value set with the FTBLOCK_writeVector macro. Note that calling this macro automatically increments the vector value. This resets the error flags that are set when a discrepancy is found between a cell array's output and the other two array outputs. Read the current array number selected for configuration. Read the current cell number selected for configuration. Read the current array number selected for fail mode injection. Read the current cell number selected for fail mode injection. Read the input selection bits. Read the current vector applied to the cell array. Whether this is the value actually applied to the cell arrays depends on the input selection settings set using the FTBLOCK_writeInputSel macro. Read the contents of the target RAM currently pointed to by the vector set using the FTBLOCK_writeVector macro. Read the output and match data from the three cell arrays. The format of this data is shown below. Note for each bit pair, the MSB corresponds to the odd parity bit and the LSB to the even parity bit. Read the error flags that are set when a discrepancy is found between a cell array's output and the other two array outputs.